Welcome back to EvoAnth v. AiG round 2. If you cast your mind’s eye back a few weeks you’ll recall Answers in Genesis – famous purveyor of all things creationist – decided little ol’ me was worth a ~6,000 word rebuttal. My original response concentrated on the introduction of their piece since I’m rather lazy and not inclined to respond to 6,000 words in a single sitting. If you recall I wasn’t particularly impressed with their introduction, which seemed more keen on throwing out as many creationist buzz words as possible regardless of whether they were actually applicable to the situation. My favourite was when they claimed one of my points was an assertion (as in, provided without evidence) then went on to dispute the evidence I had provided. Point scoring rather than intellectual honesty was the name of the game. This post focuses on their response to my claim that the foramen magnum of Australopithecus afarensis is located underneath the skull so it can balance atop a vertical, bipedal body. This is key because our ancestors should look like they’re developing obligate bipedalism, and a foramen magnum would certainly be confirmation of that. AiG disputes this by citing two skulls – AL 444-2 and AL 822-1 – which they claim refutes my central premise. The former skull I discussed in my original post, noting that it has a relatively high “foramen magnum index” which is what one would expect if it were bipedal. 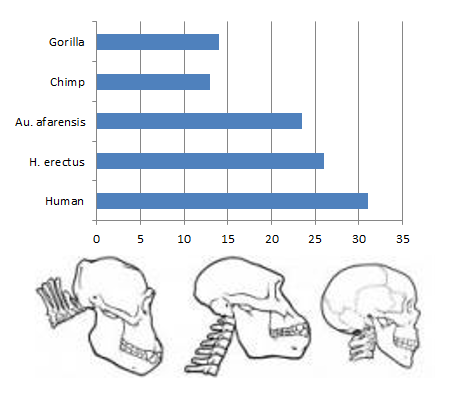 Their criticism is that the method used for calculating the foramen magnum index excludes the ape-like jut of the skull’s jaw. However, this is a moot point since the same calculation was used on all the animals included in the FMI comparison. The second is that the aforementioned calculation requires the opisthion (located on the occipital bone), which is missing from the AL 444-2 specimen. What they fail to mention is that we have several examples of Australopithecine occipital bones which can be used to reconstruct AL 444-2, providing the missing data needed for these calculations. Of course, this is simply a smear campaign. They provide no evidence of any misdoings in the lab; nor anatomical justification for why the reconstruction is suspect. It’s just handwaving talk of “oooo biases” and “oooo incomplete skull” with no real meat to it. Still, it would be nice to have a complete skull to remove any lingering doubts of bias. Boy wouldn’t that really give AiG’s argument a good beatdown. But if such a specimen existed, surely AiG would’ve brought it up because they are intellectually honest. Since they didn’t that must mean it doesn’t exist. Alas this is not quite definitive proof of my position since it is the skull of a juvenile; and the foramen magnum can move during development. Nonetheless it is located in a much more human-like position than an ape of comparable age. When this fact is combined with the relatively high FMI of the other skulls (as well as other examples of the foramen magnum not discussed here) I think it’s more than enough evidence for the idea that Australopithecus afarensis had a foramen magnum suited for bipedal locomotion. *The range of the FMI for Au. afarensis is 19-24%. However, the lowest value is still significantly higher than the value for chimps and the average value (22%) is even more so. Just an interesting story. In 1955 I took a course in physical anthropology taught by the late Chad Oliver. One day he showed us a rock concretion someone had brought in thinking it might be the fossilized skull of a primitive human. It sorta looked like one. One of the things it had, if your imagination was adequate, was a foramen magnum. Dr. Oliver pointed out that this structure was too far forward under the skull to belong to a primitive hominid. You’re really dating yourself there aren’t you? Did this happen right before he explained how piltdown was the best thing ever (yes, I know the dates are wrong although I am surprised how such accurate records were preserved across the mists of time)? I volunteer at a local museum where they have 2 human evolution exhibits. The older one is probably only ~15 years old but is still laughably obsolete, referring to a human/chimp divergence occurring ~5 mya, for example. I think these anecdotes serve as a good reminder against dogma. I googled him. I was not disappointed. I used to be a rabid science fiction fan. While in high school, I would read fan letters, in Planet Stories, Thrilling Wonder Stories, and the like, written by a Chad Oliver from Temple TX. While taking the course, I asked Chad Oliver if he was one and the same. He admitted it, but asked me not to say anything about it. I did not mention it until after he passed away. I was searching through my University library the other day and found an old book by Robin Dunbar – of the social brain hypothesis fame – from back before he’d come up with it. Strange to think that people have…changed. I don’t know if you’ll see this, but apparently the page you linked to with the australopithecine occipital bones seems to be gone. Any other sources for the paper? 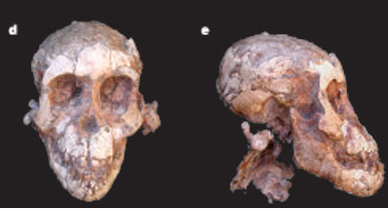 The link was to one of my favourite articles on the species; ““Lucy” redux: A review of research on Australopithecus afarensis”. The link in the text has been updated; in case you don’t fancy googling it. Oh yeah, I actually did google it. I just used the names it mentioned in the previous link. Thank you though, it shows that you keep up with people. I’d probably be gone for weeks on end.